MS/HS Parents: 3rd quarter report cards were handed out for students to pick up today.. You can also view them on Skyward Family Access under the Profile tab. Thank you! April 11 - All after school activities are cancelled. Reminder Kickapoo Basketball Camp, July 29th and 30th, we are hoping to fill this camp with Kickapoo students. We will hold the remaining spots until May 3rd at which time we will open the camp to others. Baseball & Softball - Apr 11 - Kickapoo @ La Farge - POSTPONED TO MAY 3. New Lisbon @ Kickapoo that was on May 3 is now CANCELLED for La Farge game. If any elementary wrestling students still have wrestling equipment, please get it turned in to Mr. Clements as soon as possible. 7th Grade Parents: Field trip permission forms went home with students on Monday, April 8th, regarding next week's trip to the Mississippi River Museum and Aquarium. Please make sure they are signed and returned with payment to Ms. Nelson by Monday, April 15th. The Middle School Career Fair at the Kickapoo Valley Reserve scheduled for Wednesday, April 10th, has been postponed until April 30th due to impending weather. 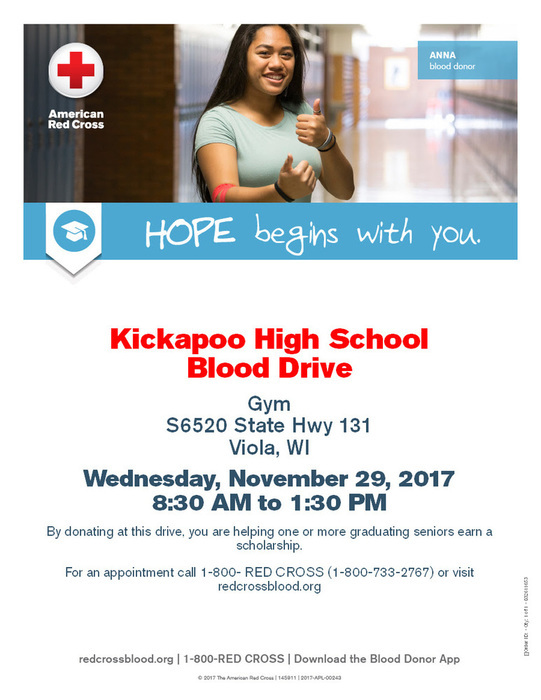 ATTENTION- KICKAPOO HS PARENTS & SENIORS! Your graduation cap/gown/announcements will be delivered at school on MON., APRIL 15th @ 9:38am. Items must be paid for to be picked up. JV Baseball at Wauzeka tomorrow (Sat) is postponed TBA. SB Game today has been moved to Viroqua @ 4:30pm...our field is not quite ready. The Jostens rep will be here Monday, April 15th at Resource to hand out graduation orders. If you haven’t paid for you order, please do so at this time. Tuesday March 26 - Softball - Kickapoo @ Hillsboro - Postponed TBA. 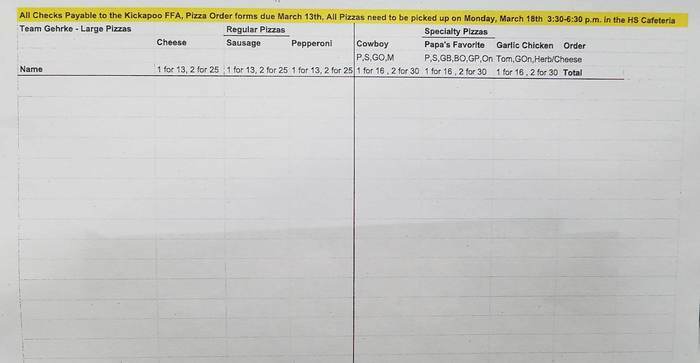 The rest of the Team Gehrke pizzas may be picked up at 3:30 p.m. today. Thank you for supporting this great cause! REMINDER: The end of 3rd quarter will be on Wednesday, April 3rd. WINTER SPORTS BANQUET: Just a reminder that the Winter Sports Banquet will be held on Monday, March 25 at 6 p.m. in the Auditorium. FFA Apparel For Sale: The Kickapoo FFA is selling apparel through March 25th via an RBS Online Store. Please use the link https://kickapooffa19.itemorder.com/sale to purchase your items. Any questions, please contact Mr. Kast. Forensics and Track are still on for today, March 16, 2019. Tonights Drama performance will be postponed. Tomorrow's is still on as of now. There will be no PM 4K this afternoon, March 15, 2019. MENU CHANGES: With no school today, the menu has been changed for the rest of the week. You may find the current menu on our web page or the app. We are closed March 13, many gravel roads are impassable at this time. HS Softball practice Monday at 6:00am is cancelled. 4th and 5th grade wrestling practice is cancelled for tonight, Friday, March 8th. ACT TEST A reminder that the Juniors will take the ACT test on March 12th. They will be able to leave after everyone has completed the test. Please encourage them to do their best! 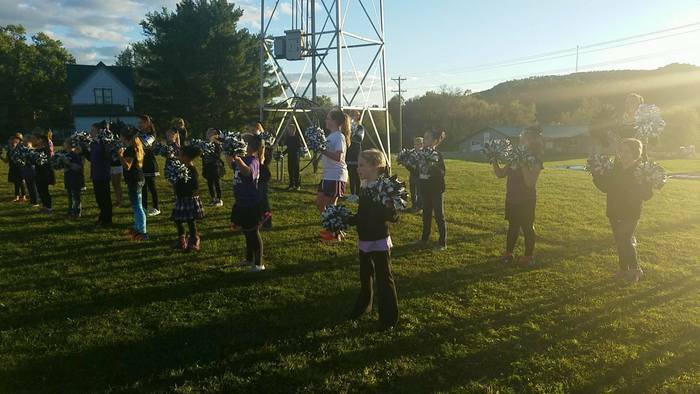 Cheerleading Tryouts: Tryouts for next year's Fall and Winter squads will be held this week. Wednesday and Thursday will be practices and tryouts will be Friday after school. Any questions, please see Mrs. Martin. The boys played well tonight but lost 54-48 to Wauzeka. Congratulations to the coaches and players on a great game and season. It is Read Across America Day today! Remember the theme is Books and Badges! You will see many police officers in the building this morning...to encourage reading!! 5th grade boys basketball will have practice on Friday, March 1st from 4:00 p.m. to 5:15 p.m.
8th Grade Graduation Due to the snow days and school now being scheduled through June 7th, 8th grade graduation has been moved to Thursday, June 6th. There will be more info to follow as we get closer. Kickapoo Boys Basketball defeats Cassville 49-45 in overtime to advance to Round 2 of the WIAA Regionals - Friday, March 1 - Kickapoo @ Wauzeka-Steuben - 7:00pm tip. Monday night GBB game updates... Pre-sale tickets will be available in the HS office from 8-1. Cost is $5. The fan bus will leave from the HS parking lot at 4:00. Sign-up will run from 8 - 1, or when the bus is full. Please have your child sign themselves and family members up or call the HS office. There is no cost to ride the bus. Go Lady Panthers! Girls Regional final ticket pre-sale will be from 8:00am to 1:00pm on Monday in the HS office. All tickets are $5. No sales before 8:00am Monday. Monday Fan Bus Info...... Students should sign them themselves and any other family members up, in the office, by 11:00 am on Monday. Any other people wishing to ride the fan bus should call the office at 627-0100 and be added to the list. Please watch the website for a departure time. Girls Regional Final at Black Hawk has been POSTPONED to Monday at 7:00pm. Please contact the office on Monday at 627-0100 for fan bus information. Fan Bus - Blackhawk / Kickapoo GBB game There will be a fan bus for tomorrow's game. Students who signed up today will be given first priority. After those students, it will be first come/first serve until the bus is filled. There will be no cost to ride the bus, but there is a $5 admission for the game. Please stay posted to the website for a possible game cancellation and bus departure times. In the event tomorrow's game is cancelled, due to weather, there will be a fan bus for Monday night. Students will be able to sign up in the office and anyone else wanting to go should have their children sign them up or call the HS office at 627-0100 to be put on the list. Congrats Lady Panthers! The Girls Regional final will be at 7:00pm at Black Hawk tomorrow, weather permitting. Fan bus info TBA. Congrats to the Lady Panthers as they defeat Potosi/Cassville 47-42 and advance to the WIAA regional final! Game is scheduled for 7pm Saturday, weather permitting, site TBD. All youth Basketball is cancelled for Saturday, 2/22. Some host locations have already cancelled, we are calling off all youth travel. 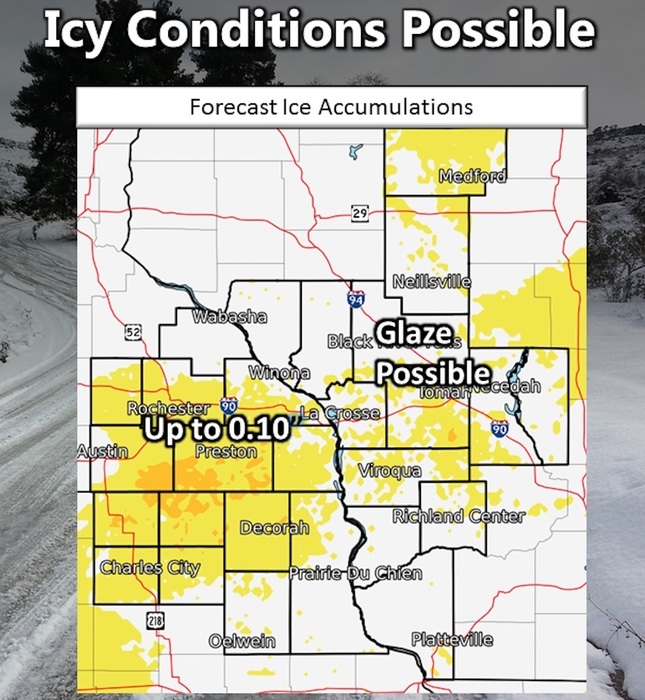 Be safe if you are out and about tomorrow morning, freezing rain on the way. GBB conference champion shirts will be in before the end of the school day on Friday. For those who ordered them, please bring money so they can be paid for at pick up. **Added Pep-Band** Since the girl's won on Tuesday night, we will be playing for their home game tomorrow (Fri). Arrive 6:15, Ready by 6:30. Good luck team!! JV and Varsity GBB team members are reminded to bring their dark uniforms for pictures after school tomorrow, Thursday, February 21st. Kickapoo Lady Panthers defeat Benton 54-36 and advance to the second round of the WIAA tournament on Friday, Feb 22 at home...7:00pm tip...hope to see you there! Light snow is expected to begin early tomorrow, we will make the call in the morning but the hourly weather looks favorable to get students to school. If we have school we will not have 4K tomorrow, we do not want buses on the road during the middle of the school day. Kickapoo Area School District is seeking applications for a part-time cook in the Food Service department. Basic knowledge of food preparation is preferred. This position would be for 29.75 hours per week. Starting hourly wage is $12.26. Benefits include, Long Term Disability, and WRS State Retirement. Please submit a resume and three letters of recommendation to: Douglas Olsen, District Administrator Kickapoo Area School District S6520 State Hwy 131 Viola WI 54664 Phone: 608-627-0101, or dolsen@kickapoo.k12.wi.us Position is open until filled. The Kickapoo Ares School District is seeking substitutes for the food service, special education aide, secretary, and custodial departments. Anyone interested in subbing in any of these areas can contact the District Office at 608-627-0102, or email kdeaver@kickapoo.k12.wi.us for more information. The Kickapoo Area School District is an equal opportunity employer. Reminder to vote in the School Board Primary being held today. The ACT test is scheduled for tomorrow, February 20th. All Juniors must be present to take it. Should we have inclement weather, it will be rescheduled for a later date. Congratulations to the 2019 Ridge & Valley Girls Basketball Champions! School Calendar: School will be extended into June and make up days will be June 3-8th. We will also have school on March 8th, and the early release scheduled for April 10th will be a full student day. We may also have to add more minutes to the school day in the future. School is canceled for Wednesday, February 13, staff to report at 9 am for professional development day. Staff check your e-mail for further instructions. Feb 12 * HS Girls Basketball @ De Soto - POSTPONED TO WED FEB 13 Varsity ONLY at 5:30pm @ De Soto * MS Girls Basketball @ Ithaca - CANCELLED * All practices CANCELLED. School is canceled for Feb, 12. We will start with a two hour delay tomorrow morning Tuesday, February 12. Let’s hope we can have school! Feb 11 Boys Basketball start times at home will be 4:30pm for JV and 5:45pm for varsity. Weather permitting. Monday Feb 11, 2019 - All Girls Basketball at Weston will start 30 min ahead of schedule. MS and JV at 5:30 and Varsity at 6:45pm. Boys basketball home against Hillsboro will also start early, exact times TBA tonight or right away in the morning. All events weather permitting. School is 2 hours late for Thursday February 7th. All elementary practices at 6 p.m. are cancelled, Sorry! Practices will be held right after school. 4th and 5th grade basketball practice at 6 p.m. is cancelled. The choir will not be making the trip to Westby this evening, all due to freezing rain. MS Girls Basketball has been moved to Weston on Thursday so both the MS & HS teams play in the same location, and those families with multiple children only have one place to be. Fingers crossed the weather cooperates! 46-34...Congrats to the Girls Basketball team on a great win over Wauzeka-Steuben! Tonight is School Spirit Night! We would like to invite all Kickapoo students to sing with the pep band before the game. We will be singing the school song, national anthem, and several other pep songs. Please meet at 6:40 p.m. in the school auditorium. Wear your panther apparel! High School Wrestling will have practice at 5:00pm today, Middle School will have an optional practice at that time. Choir members who can make it for the National Anthem tonight please do as we will still sing with those who can make it! The windchill temp. will remain between 40 and 35 below until at least 10 am tomorrow morning, therefor school is canceled for Thursday, January 31, 2019. Girls Basketball - Kickapoo @ North Crawford from Tues Jan 29 will be played on Saturday Feb 16 @ 6:00pm. Varsity only as Crawford does not have JV. Other make-up dates to come as they are available. Tuesday January 29, 2019 - All Kickapoo events and practices are postponed. Reschedule dates TBA. Due to the extreme cold, school is canceled for Tuesday and Wednesday, an announcement for Thursday will be made at a later time. Jan 28, 2019 | MS WR @ Brookwood - POSTPONED | MS GBB @ Weston - POSTPONED | JV GBB @ Luther - POSTPONED | All after school activities are cancelled. Due to the extreme cold, school is 2 hours late for Friday, January 25th. Due to the continued snow school is closed for Wednesday, January 23rd. School is 2 hours late for Wednesday, January 23rd. JAN 22, 2019 - Varsity Girls Basketball @ Crawford is postponed to JAN 29 | JV & C Team Girls Basketball @ Wauzeka is cancelled. ISO: Parents of children ages 0-5! Please remember to preregister by Wednesday, Jan. 30th for our Ages and Stages Parents Night! (February 5th at 5:00 pm). Check out our website for the flyer with registration link or call the elementary office! Thank you! All youth basketball for Saturday, January 19th is cancelled for Kickapoo. We will not be hosting and we will not be traveling. JAN 18 - Girls Basketball - Boscobel @ Kickapoo - POSTPONED TO MONDAY JAN 21. It will be parent's night. JAN 15, 2019 - all after school activities are cancelled. Since school is 2 hours late, our 5th grade Math Knowledge event is postponed until tomorrow. 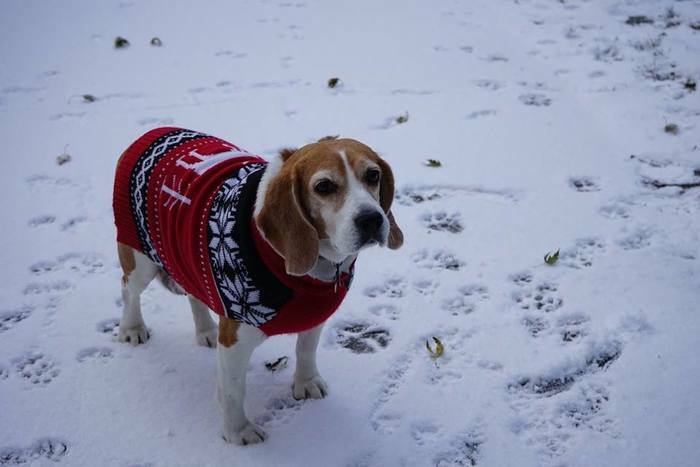 Per our Gifted and Talented network policy, we will move to our snow date of tomorrow, Jan. 16. Monday, January 14, 2019 - All after school activities are cancelled. MS Wrestling @ Hillsboro has been postponed until January 31st. There will be practice tonight. Current KASD Scholarship Recipients: Please submit your verification items for the Spring Semester. Lee Griffin Scholarship Recipients: Don't forget to fill out the verification form located in the "Scholarship Info" folder under "Documents" on the KASD web-site and submit to Debra along with your verification items. Thank you! HS final exemption forms are available in the office. They are due Friday at 3:20 p.m. No late forms will be accepted. Any FFA member interested in going to the Badger Hockey game Feb 9th, you must sign up in the Ag room by tomorrow, Wednesday, January 9th. Senior pictures, senior quotes and baby pictures are due to Amber Dobbs for the yearbook by Jan. 16th. MS students must have all missing assignments in by 8:00 a.m. Jan. 14th in order to go tubing for incentive day on Jan. 16th. Junior ACT Review Starting on January 10th there will be weekly ACT review sessions during Resource. Schedules are posted around school and all Juniors should attend. These sessions are a great opportunity to help ACT scores improve! FROM COACH CLEMENTS: Since school is cancelled, we won't be going to Royall for the MS Wrestling Meet. Kickapoo girls defeat La Farge 48-35 at home tonight! Kickapoo Boys Basketball defeats Wonewoc-Center 62-43 and Kickapoo Girls Basketball defeats De Soto 73-33 in Coach Wiegel’s 500th game! Dec 1 - Boys Basketball - Cashton @ Kickapoo - POSTPONED TBA. Fluctuating temps in the area are creating differences from one location to another, even slight changes in elevation. Very slippery spots remain. Due to the forecasted possible icing, this morning's Middle School Boys Basketball Tournament at Kickapoo has been cancelled. As of right now, this afternoon's High School Boys games against Cashton are still on, however, a final decision regarding the HS games will come around 1:00 or 2:00pm. REMINDER - 4K Screening - Wed, Dec 5, 2018 - Please call 627-0107 to set up a screening time or let us know if you can't make it that day! Reminder, there is a community meeting regarding the future of the pool. The engineering report will be presented at 6:30 p.m., Wednesday November 28th. 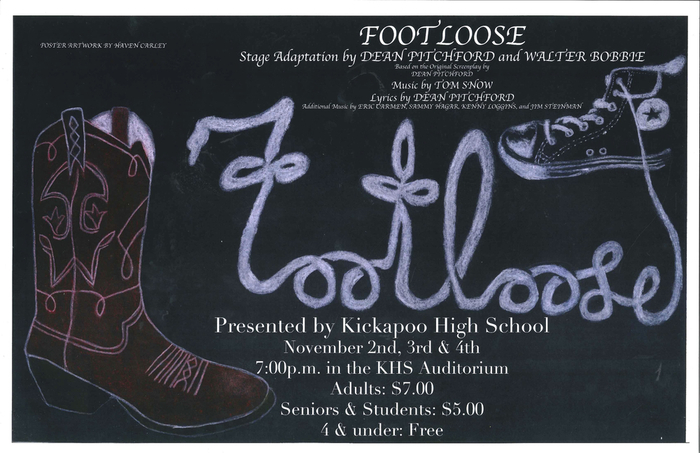 All Kickapoo clothing orders are due on Wednesday, November 21st. No late orders will be accepted due to the Thanksgiving Holiday. The DPI responded to the school districts request for a school start date waiver. In spite of overwhelming support from the parent survey, 75 percent support for an early start date, DPI denied the request on the grounds that we cannot predict we will continue to have adverse weather events. If you support an earlier school start date call your elected officials next week and let your voice be heard. FFA Fruit orders are due on Wednesday, November 7th to Mrs. Geary, Mrs. Gretebeck or Mr. Von Glahn. The board will hold a special meeting on November 28th at 6:30 pm in the auditorium. The meeting will be devoted to the results of an engineering report on the pool, interested community members should plan to attend. The board would like to hear from community members as they receive information that will help inform important decisions regarding the future of the facilities. ELEMENTARY HALLOWEEN PARADE: The correct time of the Elementary Halloween Parade today is 2:30 p.m. in the Elementary Gym. Congratulations to Anelise Egge who medaled today with her 8th place finish at the WIAA State Cross Country Meet! PEP RALLY: There will be a Pep Rally to send Anelise Egge off to Cross Country State at 3:10 p.m. today in the HS Gym. FAN BUS for STATE CC There will be a fan bus sign up in the HS office for Saturday's CC State meet at the Ridges Golf Course in WI Rapids. Kickapoo students can ride for free and adults will be charged $5. Please sign up on the sheet in the office by the end of the day on Thursday. Tonight’s tailgate party will be held in the all purpose room! Hope to see you there! MS FB tonight at La Farge will start at 4:30pm. WIAA Volleyball Regional Ticket Prices for tonight - $5 for everyone, children under six are $1. The school start date survey will remain open until the end of the school day on Wednesday. 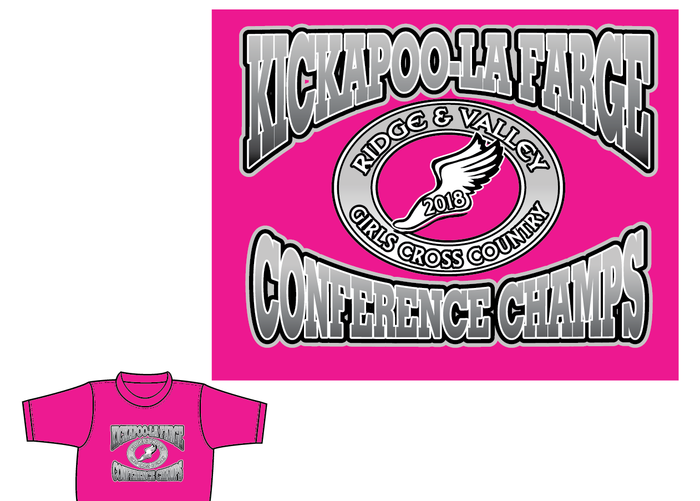 CONFERENCE CC SHIRTS $12.00 each up to XL $14.00 XXL or larger **youth sizes available Please specify sizes. Send email to: sgeary@kickapoo.k12.wi.us with order by noon TODAY! REMINDER: Cross Country shirt orders need to be in to Mrs. Geary by noon TODAY, Monday, October 15th. Walk to School day has been rescheduled for THURSDAY 10-11-18 due to rain in the forecast for Wednesday. Board agenda for Monday, October 8th posted in the News section. MS VB - La Farge @ Kickapoo - Monday Oct 1 will start at 4:30pm...change from 5:00pm. Varsity Football - Wonewoc-Center @ Kickapoo-La Farge From Aug 31...will be made up on Oct 19 @ 7:00pm @ Kickapoo. All Cross Country practices for tonight have been CANCELED. The Cross Country Meet for tonight has been postponed. There will be practice. JV & C TEAM VB TOURNEY AT KICKAPOO ON MONDAY SEPT 17 IS CANCELLED. Two of three teams have to make up conference games that day. The Kickapoo Area School District and the Board of Education have elected to waive all admission prices at the remaining fall athletic events at Kickapoo. Instead, there will be a free will donation jar at each event. All proceeds will go to area flood relief. Thank you for your continued support! Starting Monday, September 17th the district will be adding 6 minutes to the end of the school day for the rest of the school year in order to make up the flood days. Release times will now be 3:21 and 3:26 for the elementary and for the ms/hs respectively. The school district will not have an early release on September 21. With the canceling of school and the Horse and Colt Show due to flooding, we will use that extra time to offset lost minutes of instruction. MS VB Games on Monday and Tuesday have been cancelled because we have not had practice yet. The first game will be Sept 17 @ Seneca. HS & MS Cross Country from Sept 4 at Westby has been rescheduled to Sept 18 @ Westby. Thursday, Sept 6 - HS FB, HS VB, HS CC, MS FB, and MS CC Practices WILL resume today, even though we did not have school. Normal time (3:30) for all. Musical practice tonight is also on. MS VB will start officially on Monday after school with an optional practice tomorrow after school. DO NOT DRIVE THROUGH WATER. Plan your route now, and if you can’t make it, let your coach know. School is canceled for Thursday, water is beginning to recede but road checks will need to continue. A notice to all families displaced by recent flooding, if you are staying with extended family, friends, or otherwise are in transition, please inquire at the office about potential services that are available. This may include; automatic qualification for free lunch, if new housing is not located within the district you may continue at Kickapoo with transportation. Sept 8 - Kickapoo will not be attending the Lancaster VB tourney on Saturday Sept 8. We will not enough practice time before then. Friday Sept 7 - Kickapoo-La Farge vs Riverdale @ Kickapoo has been moved to Monday Sept 10 @ 6:00pm. Sept 5 - All Practices and after school activities are cancelled. AP ENGLISH MESSAGE: AP English will start at 7:15 a.m. on the first day of school. Sept 4, 2018 - All practices and after school activities today are cancelled. Please continue to monitor all announcements. The school will be open today (9/4) until 3:00 for any new Elementary and MS/HS students students who would like to register or for students to pick up their schedules. Please be careful with the roads if you are coming in. Formal teacher In-service activities are canceled for today. Scheduled HS FB Practice on Tuesday Sept 4 will be from 3:45 to 6:00pm. Please keep on eye on all announcements as the weather unfolds. Cross Country at Westby on Tues Sept 4 has been cancelled. Normal practice at 3:30-5:00. Shrek Rehearsal: We will be having rehearsal for Shrek on Tuesday, Sept. 4th with all named characters (that do not have sporting events). We will be covering Act I from 6:00 - 9:00 p.m. in the auditorium. We will cover Act II on Thursday, Sept. 6th, 6:00-9:00 p.m. The middle school football scrimmage on Tuesday, Sept. 4, is postponed due to lack of practice. It will be made up on Thursday Sept 6 at La Farge at 5:00pm. The pool will be closed until further notice. Sorry for the inconvenience. REMINDER: Just a reminder that the Labor Day Parade scheduled for today was canceled. Do you need assistance with completing disaster relief forms? The Kickapoo High School computer lab will be open on Monday, September 3 from noon-3:00 p.m. to help community members report flood damage. There will be people to assist you with typing in the forms if needed. Any new students should come and register on Tuesday from 7:30-3:30. Also MS/HS students may pick up their schedules then as well. Parents, please know we will be asking students for any school supplies/clothing, etc. needs they have when they return on Wednesday. Our thoughts are with everyone during this very difficult time and we will do all we can to make sure kids have what they will need. The school will be open on the following dates and times for people to access the showers and get to supplies dropped off by the Red Cross and emergency management. Saturday 12-3, Sunday 10-3, and Monday 10-3. Middle school volleyball practice will begin on the first day of school, Wednesday, September 5th. Practice will run from 3:30 to 5:00. All practices are CANCELLED FRIDAY. All practices will resume Tuesday. Kickapoo-La Farge will play football at Riverdale on Friday as normal. Make up FB game with Wonewoc-Center/Weston will be announced next week. The District will be postponing the start of school to Wednesday, September 5th. Teachers will have a scheduled day of inservice on Tuesday, September 4th. We hope this will give more time for cleanup and inspection and repair of roads. The power to the school is back on, but there are limited ways to get to the school. Some employees will be at the school on Friday. I know everyone wants information about if school will start on Tuesday, but right now we are gathering information to make the best decision we can. With more rain potentially in the forecast, patience is required. Please know we are conferring with emergency management and county officials to make these decisions. Volunteers are needed in the Village of Viola as there are many people in need all over. If you are able to help please contact Beth Campbell at the Village hall in Viola. Thoughts with everyone in this difficult time. 8/31/18 - Football - CANCELLED Wonewoc-Center/Weston @ Kickapoo/La Farge CANCELLED. Make up info to follow. Thursday 8/30/18 - Volleyball - La Farge @ Kickapoo has been cancelled. All practices at Kickapoo are also cancelled. Be safe. 8/29/18 - All practices and school related events are obviously cancelled. Please stay safe! 8/28/18 - All athletic events and practices at Kickapoo and La Farge today are canceled. Due to flooding, and the impending rise of the Kickapoo river, and the west fork already flooding, the spaghetti supper is canceled for tonight. Formal in service activities for teachers are also canceled for today and tomorrow. All band activities that were scheduled for this morning are cancelled. The pool will close at 3:30 each day 8/21 - 8/24. Also a reminder that the pool will be closed from 8/27 - 9/3. The pool will open for regular school hours on 9/4. Please check the school website for any scheduling changes and updates. Thank you! MS VB Practice - Middle School Volleyball practice will officially start on the first day of school, September 4th, from 3:30 to 5:00 pm. There will be an optional practice on Thursday, August 30th from 3:30 to 5:00. All practices will take place in the elementary gym. Due to the number of 7th & 8th graders playing Volleyball, gym space, playing time, etc, we will NOT be offering volleyball to 6th graders. Scholarship Recipients: If you have not already done so, please send your Fall semester verification items to Melissa Powell in the District Office so she can process your scholarship checks. Thank you! Sorry for the inconvenience, but the pool will close at 3:30 on Monday, August 20th. Thank you! The first day of MS FB practice will be August 23 at 5 pm @ Kickapoo. Students going into grades 6 through 12 can pick up their schedules on Wed., Aug. 22nd between 7:30AM - 4:30PM. New students can also register and speak with Mr. Donovan to schedule classes. Summer strength and conditioning will remain the same time for the last two weeks of class due to large class sizes. Pool Updates......The Kickapoo pool will be closing at 5:00 (weekdays) August 13 - 24th. The pool will be closed from August 27th - September 4th. Normal pool hours will resume on September 5th. *Please check the website for any changes and updates to the schedule. Thank you! The Babysitting Class will be having a Meet & Greet this Wed., July 25th, from 10:00 - 10:30 a.m. in the elementary cafeteria for people with children who are in need of babysitters. T-ball is cancelled for tonight. The last practice will be in Viola next Thursday night. The pool will close at 3:00 on 7/10. Sorry for the inconvenience. The district is advertising for a high school math teacher due to Mrs. Griffin accepting a position at the Westby School District. Applicants can apply through WECAN. Please share widely! The pool will be closed on July 4th. Happy 4th of July! The pool will be closed on Sunday and Monday, June 24 & 25. June 21, 2018 - ALL Summer Baseball, Softball, and TeeBall are cancelled. The Pool will be closed Thursday June 21 and Friday June 22. June 20, 2018 10U, 12U and 14U baseball will played at the North Crawford school instead of Soldiers Grove Game times will be the same 10U at 4:00, 12U at 5:00, and 14U at 6:30. JUNE SUMMER ART CANCELLED: Just a reminder that the June session of Summer Art has been cancelled due to low enrollment. STATE TRACK RESULTS: Congratulations to Ayden Fleeharty who placed 6th today in pole vault at the State Track Meet! STATE TRACK RESULTS: Congratulations to Wyley Wagner who placed 3rd in the D3 Triple Jump today with a jump of 44'2.5"! High School Track athletes can start bringing their washed uniforms in to Mrs. Geary ASAP. A fine of $55.00 will be added to your checkout sheet if these are not in by Friday. 8th grade graduation tonight starts at 7:00 p.m.. Students please be here at 6:40 p.m.
Sports Physicals will be held at the LaFarge High School tomorrow from 5:30-7:30PM. The cost is $20. This is a good time to get them done and at a low cost. Due to lack of numbers, there will be no 14 and under summer softball. REMINDER: Tuesday, May 29th is the High School Incentive Day. Students are reminded to bring their own lunch if they didn't sign up for one from school. The Kickapoo School District is still looking for a middle school social studies and science teacher for the 2018-19 school year. We are looking for a staff member that will be a great fit with our current staff. If you are seeking a teaching job with; competitive pay and benefits, a great group of colleagues, and a top notch work environment, look no further. Middle school teaching is not for the faint of heart, but these kids are fun to watch as they grow socially, emotionally, and academically. Start down your road to becoming a PANTHER now, contact Mr. Mithum if you are interested or apply through WECAN. Hello, We wanted parents to know that we practiced our second school safety lockdown of the year today. This may generate some discussion at home about what happened and any thoughts surrounding it. Thank you! Monday, May 21, 2019 - Baseball - Kickapoo @ Weston - CANCELLED. JV baseball today is cancelled. Wauzeka does not have enough players. Anyone who is interested in the Tractor Safety class in Viroqua in June should see Mr. Kast to get a registration form. Any 6th, 7th or 8th grade boy interested in playing baseball this summer, please see Mr. Wiegel for a sign up sheet. Cheerleading tryouts will be May 29th-June 1st. Those entering grades 9-12 who are interested please sign up on the Art room Door. Softball today (May 17) at Ithaca is cancelled. Baseball will be played as scheduled. 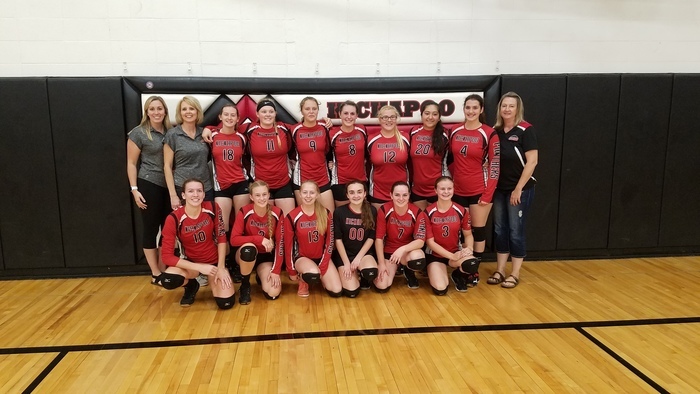 Viterbo will be offering a Volleyball Camp here at Kickapoo June 11-13 for girls entering Grades 6-12. See Mrs. Matthes or Ms. Schullo for a pamphlet. Summer Strength and Conditioning will be starting on Monday, June 4th. Please bring your Summer Strength and Conditioning sheet into Mrs. Geary by next Wednesday, May 23rd. The pool will be closed on 5/16. Sorry for any inconvenience. The MS Track Party will be Tuesday, May 22 after school until 5:30. Please have athletes bring their team shirt for a picture and swimsuit and towel for swimming. The pool will be closed on Sunday, May 13th for Mother's Day. Four Middle School Future Entrepreneurs teams each received $500 to start businesses. Evelyn Hajzl (Writing in Style); Lauryn Sumwalt (Slime Essentials); Jace Dean and Nolan Alexander (DNA Hydrographics); Jayla Nagel, Helen Clements, and Madilynn Montgomery (Driftless Floral) have been working hard to prepare business plans. On Thursday, May 10, they had to present their ideas at a CESA 3 function in Lancaster where they received positive feedback as well as the VISA cards. The money is available from a state grant that CESA 3 was awarded. The teams will continue developing their businesses over the summer and then present in November in front of a "Shark Tank" type audience. Congratulations to these students and their advisor Mrs. Olsen, good luck in the "Tank"
MS track meet as Cashton tomorrow. Bus will be leaving at 8:30, please be to school by 8:15. There will be no long jump or triple jump. Due to limited space, only those participating in the meet are able to ride the bus. The Kickapoo School District is accepting sealed bids for a 2003 IC 59 passenger bus. The bus has a 444 engine with 166,703 miles, it is 27,500 GVWR. Sealed bids should be sent to the attention of Mr. Olsen at S6520 State Hwy 131, Viola Wi. Bids are due at 3:00 p.m. on June 8th. The board will open and act on the bids at the June 11th board meeting, the board reserves the right to reject any/all bids in its sole discretion. Tomorrow's Fun Friday Dress Up Day (May 11th) is Cowboy/Western Day. YEARBOOKS ARE IN! The 2018 Kickapoo yearbooks have arrived and can be picked up from Mr. Starkey. If you didn't pre-order a yearbook and would like to get one, they are for sale for $45. Champion Games @ Boscobel on Friday May 11 has been postponed and rescheduled for Monday May 14. Kickapoo High School was named a Silver award winner as one of US News and World Reports Best High Schools in America for 2018. Kickapoo has been an award for 11 of the 12 years that US News has used their methodology. This is the fourth time that Kickapoo has been awarded a Silver award. GO PANTHERS! MS TR at North Crawford from May 3 has been schedule to Wednesday, May 9th. No MS track practice tonight, May 3rd. Reminder: Summer School registration forms are due to the elementary office by Friday, May 4th. Due to tonight's NHS banquet, MS track practice will go until 5 pm. CORRECTION: The 6th & 7th Grade Field Trip to the Kickapoo Valley Reserve that was postponed today (May 2) is reschedule to MAY 22 (not May 29). All students going to state solo and ensemble on Saturday, your permission slips for riding the bus or with parents are due tomorrow, May 3rd. Baseball and Softball tonight (May 1) at New Lisbon will start at 4:30...bus leaves at 3:00. The May 2 6th & 7th Grade Field Trip to the Kickapoo Valley Reserve has been postponed to May 29. POOL ON WEDNESDAY, MAY 2 ~ The pool will be closing at 5 p.m. on Wednesday, May 2nd due to the National Honor Society Banquet. Please check the pool schedule due to recent changes. The last day the pool will be open will be Wednesday, May 25th. Summer pool hours will be posted at a later date. Great job to the bands and choirs at contest yesterday! HS band and choir earned 1st ratings, MS band a choir earned 2nd ratings. Thanks again for your strong efforts! FFA Officer Nomination form are due to Mr. Kast by 3:30 on Thursday of this week. If you are interested in running for an FFA office next year, and did not get a form, please see Mr. Kast. Seniors and 8th graders please turn in your Brewer game permission slip and payment in by the end of the day tomorrow, Wednesday, April 25th. Large group contest is in Westby tomorrow! Please bring/wear your dress clothes. Middle School band and choir we need to be leaving before school starts if possible. Please be to school by 7:45 a.m.
NEW DATE: May 1 - Baseball & Softball - Kickapoo @ New Lisbon - 5:00 p.m.
Apr 19 - Baseball & Softball - Kickapoo @ Seneca - POSTPONED TO MAY 15 @ 5:00PM Softball vs. Royall on May 15 is Cancelled. The Riverdale Middle School Track Invite for Friday April 20th has been cancelled and will NOT be made up. Screenagers Rescheduled Due to the impending weather, tomorrow, the showing of Screenagers has been rescheduled to April 25th. Same time, same place. MS Track at Crawford on Tuesday is cancelled...There will still be practice until 5 p.m. on Tuesday. There will be MS Track practice today, Monday, April 16th, until 5 p.m.
Lee Griffin Track Meet @ Kickapoo on Monday is cancelled. The pool will be closed on Sunday, April 15th. Due to the impending weather Prom has been postponed until April 28th. We apologize for any inconvenience this may cause, but student safety is our highest priority. Saturday’s baseball games at Woodside Sports Complex in Mauston have been cancelled and will not be rescheduled. EARLY RELEASE: Just a reminder that today, Wednesday, April 11th, is a 1:00 p.m. early release. Track @ North Crawford on Tuesday Apr 10 has been postponed to Apr 19. Swimming Reminder: All K-5 elementary P.E. classes will be swimming during P.E. from April 9 - April 27. Please remember to pack suits/towels in a separate bag on their P.E. days. MS Track @ Viroqua on April 9th has been CANCELLED. There will be no MS Track Practice today, Friday, April 6th. Baseball & Softball tonight (April 5, 2018) has been postponed. Var TR Invitational at Wisconsin Heights tomorrow, April 6th, is cancelled. Summer Strength and Conditioning: Summer Strength and Conditioning sign up sheets are in the office. Please pick them up if you are interested. They are due May 23rd to Mrs. Geary. Middle School Track Practice will be done at 5 p.m. on Thursday, April 5th instead of 5:30 p.m.
HS Track Athletes: Please bring practice clothes and swimming suits and towels for practice today. The KHS Blood Drive on Wednesday, April 4th will be held from 9:30 a.m. to 2:30 p.m. in the KHS gym. There will be a 1:00 early release today, April 3rd. All after school activities are cancelled. There will be a 1:00 p.m. Early Release on Wednesday, March 28th. There will be no school on March 29th or 30th. Classes will resume on Monday, April 2nd. There is NO track meet at Richland Center tomorrow, March 27th. Donkey basketball will be April 22nd. Tickets can be purchased in the MS/HS office for $7.00 each. There are leftover HS yearbooks from last year on sale for $35.00. See Mr. Starkey or a yearbook member to purchase one. Correction:Boys and Girls Basketball Awards Night will be Monday, MARCH 26 (not April) @ 6:30pm in the Auditorium. Boys and Girls Basketball Awards Night will be Monday, April 26 @ 6:30pm in the Auditorium. Extra Note: Because of the size of our MS and HS swing choir groups, we will be performing in the new auditorium, not site 3 (MS choir room). All other events will stay in the scheduled rooms. REMINDER: 5th grade Band parent meeting TONIGHT, March 8th, in the Elementary Cafetorium at 7 p.m.
5th Grade Band Parent Meeting: We are going to reschedule our 5th grade Beginning Band meeting that was scheduled for tonight to Thursday, March 8th, at 7:00 pm in the Elementary Cafetorium. Kickapoo Boys Basketball defeats Iowa-Grant 68-58 and advances to Round 2 of the WIAA playoffs...Kickapoo @ De Soto, Friday, March 2, 7:00pm tip. FFA activities will be Monday! Wear your FFA t-shirt or your favorite tractor t-shirt. Do NOT drive your tractor...we will have that later this spring. WIAA Girls Basketball at Potosi will be played as scheduled! Boys Basketball tonight (2/22/18) @ De Soto has been cancelled. Practices at Kickapoo will still be held as scheduled. The Kickapoo Lady Panthers defeat the Iowa-Grant Lady Panthers 65-63! Kickapoo moves on to play @ Potosi Friday night (Feb 23) @ 7:00pm in WIAA Regional Round 2. Drive Your Tractor to School Day has been postponed for this week and will be rescheduled for a later date. The ski trip for Wednesday, February 21st, is still on as scheduled. A decision regarding tonight's GBB regional game will be made later today. School is canceled for Tuesday, February 20, Stay Safe! After watching the incoming weather and discussing with our superintendent today, it’s been decided to move our 5th grade instrument testing to next week Monday and Tuesday, February 26 & 27. The 11/12 PE Field Trip for this afternoon has been postponed and will be rescheduled for a later date. Ithaca just informed us they do not have enough for C Team tonight, so there will be no C Team BBB game @ 5:00. JV will stay @ 6:00, with Varsity @ 7:15. ELEMENTARY TRACK & FIELD DAY: Elementary Track and Field Day will be held on May 16 this year. Parents/Students have until February 23 to order yearbooks. They may be purchased online at jostensyearbooks.com or by seeing Mr. Starkey. Kickapoo Boys Basketball defeats Royall in the battle of the Panthers! FEB 8 - MS & HS Girls Basketball games (Weston @ Kickapoo) are cancelled, make-up TBA. All practices at Kickapoo are still on. MS WR at N Crawford is also still on at this point. There will NOT be MS GBBB practice tonight, Feb. 7, 2018. There will be no MS GBB practice today, February 5, and the pizza party will be held on Wednesday night, February 7, after school. Reminder: Community Track meeting & discussion. 6:15pm tonight in KHS Auditorium. Current Scholarship Recipients: A reminder to please submit your verification materials so that you can receive your Spring scholarship funds. Kickapoo Lady Panthers defeat North Crawford 48-30! Any schedule changes must be done this week. No schedule changes will be accepted after Friday. Seniors: Reminder that you need to turn in your baby picture, senior picture and senior quote to Megan Gallimore by Jan. 31st. Kickapoo Lady Panthers defeat the De Soto Pirates 63-21! Monday 1/22/18 - MS GBB Basketball @ De Soto is Cancelled. All practices are also cancelled. The pool will be closed tonight, Jan 18, 2018. The Girls Basketball game from Jan 11 has been rescheduled to Jan 30 - Kickapoo @ Seneca - JV @ 6:00 - Varsity @ 7:15. 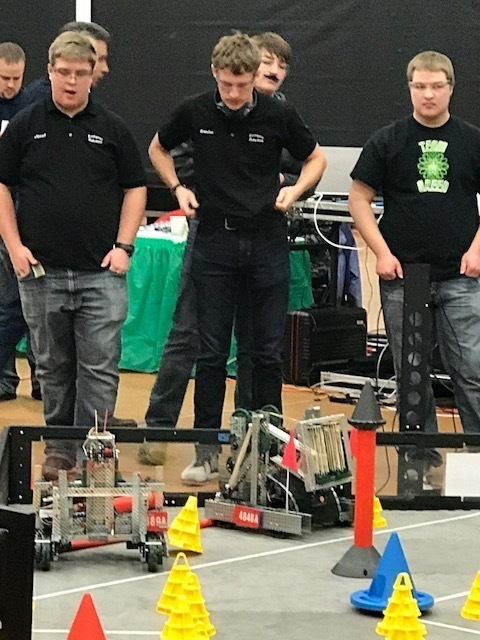 Congratulations to the Kickapoo Robotics Team which finished 4th overall out of 36 teams in Oconto Falls this weekend. Kickapoo Boys Basketball defeats Weston 74-22. MARK YOUR CALENDARS: The Kickapoo PTO's Family Fun Night is Wednesday, February 7th. More details to follow. EXEMPTION FORMS DUE TODAY: All HS Semester Exam Exemption forms are due to the office by the end of the day today, Friday, January 12th. School will release at 1 pm today, all after school activities and games are canceled. The Vernon Electric Scholarship is due Jan. 17th. If you want Mr. Donovan to mail it for, it must be in to him by the end of the day on the 15th. Kickapoo Lady Panthers take down the Royall Lady Panthers 51-35! Preschool screening is January 17. Details can be found in the News section. DRAMA CLUB PRACTICE: A reminder that Drama Practice starts after school from 3:30-4:30 in the auditorium today. SEMESTER EXAM EXEMPTION FORMS: Exemption forms will be handed out today. They are due at the end of the school day Friday, Jan. 12th. Congrats to Jalen Alexander on scoring his 1000th point tonight! Please join us on Friday Jan 12 before the Weston game to honor this excellent milestone. Game time is 7:00 pm as there is no JV game that night. 52-27 Kickapoo Lady Panthers defeated La Farge last night to improve to 8-2 overall and 6-1 in conference play. MENU CHANGES: The menus for both January 15 & 16 have been changed & updated on the app & webpage. Please make note of this. Middle school bird seed fundraiser is due tomorrow. If you need to, you can collect money when you deliver the items. Reminder from Mrs. Geary & Mr. Lee for 6th grade P.E. to bring swimming suit and towel as we will begin swimming Tuesday, January 2nd. Mrs. Walter's Zero Hour AP English Class for Tuesday, January 2nd is CANCELLED due to the weather. Kickapoo Boys Basketball defeats Westby 56-45! Come see the 7-1 Boys Basketball Team play the 4-1 Seneca Indians tonight! The Annual Community Holiday Dinner will be held from 5-7 p.m. tonight. Monetary gifts and/or non-perishable food items are greatly appreciated. Donations will go to local organizations. La Farge called at 3:30pm and said they do not have enough for JV tonight, so JV game os cancelled. Varsity game will start at 7:15pm. There is NO 4th Grade basketball practice today, Friday, December 15th. Kickapoo Lady Panthers defeat the Wauzeka-Steuben Horents 50-46. No MS BBB practice today, Wednesday, December 13th. JV BBB Practice will be in the elementary gym tonight at 3:50 p.m. The Elementary Holiday Concert is today, December 12th, at 1:45 p.m. in the Auditorium. Kickapoo Lady Panthers defeat the New Lisbon Rockets 57-43. FFA Fruit Money: All FFA fruit sales money must be turned in by this Friday, December 15th to Mr. Kast. Kickapoo Boys Basketball defeats Cashton 67-48 to improve to 6-0. 75-36 Kickapoo Boys Basketball defeats North Crawford. MS BBB Practice: There will be no MS BBB practice on Wednesday, December 6th. Kickapoo Boys Basketball defeats Wonewoc-Center 64-41! Students applying to UW Richland and UW Baraboo have until Dec. 4th to apply and have the application fee waived. 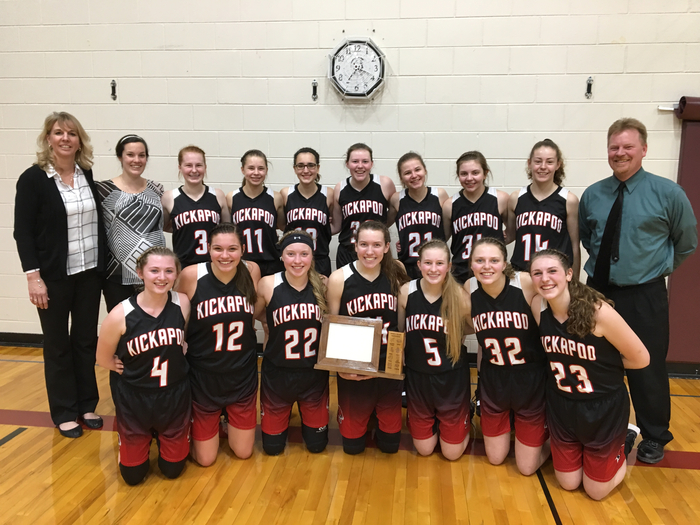 7th & 8th Grade GBB Practice: There is 7th and 8th grade girls basketball practice tomorrow night in the elementary gym from 5:30-7:00 p.m.
Kickapoo Blood Drive today, 8:30 a.m. to 1:30 p.m. in the HS Gym. By donating at this drive, you are helping one or more graduating seniors earn a scholarship. Kickapoo Lady Panthers defeat the Seneca Indians 36-35! There is a 1:00 p.m. early release today and no school November 23rd and 24th. Have a Happy Thanksgiving! The Kickapoo Panthers defeat the Coulee Christian Eagles, 61-46! Please see the recent article on the app. under the news section regarding the annual meeting and your taxes. Have a Happy Thanksgiving! Weston does not have enough for JV boys Basketball right now, so the JV Game on Dec 1 has been cancelled and the varsity game will start at 7:00pm. Kickapoo Lady Panthers defeat the Wonewoc-Center Wolves 52-27! Senior Pics Due: Senior pictures for the Yearbook are due by December 17th. Yearbooks on Sale Through Tomorrow: HS Yearbooks are currently $39. After Friday, November 17th, they will be $45. This is the only sale this year, so get them today! Hillsboro does not have enough for JV Girls Basketball, so on Monday Nov 20: JV game CANCELLED...Varsity moved to 7:00pm start time. Monday NOV 20 - Hillsboro does not have enough to play JV GBB, so the JV game on Monday is cancelled and the varsity game will start at 7:00pm at Hillsboro. Middle School Girls Basketball Players: There will be no tournament this weekend at Weston due to deer hunting. The Weston tournament has been moved to December 2nd. No practice tonight for MS Boys Basketball. Just a reminder that there is no school on Friday, November 10th. P/T Conferences: Just a reminder that Parent/Teacher Conferences will be held tonight and Thursday night from 3:30-7:30 p.m. The football awards banquet will be on Tuesday, November 7th at 7:30 pm at Kickapoo. Hope to see you there. Seniors bring drinks, juniors desserts, sophomores salads or chips, and freshmen bring drinks. VETERANS DAY PROGRAM: The annual Veterans Day Program will be held on Thursday, November 9th at 10:50 a.m. in the HS Gym. Seniors, the Rural Route popcorn will be in on Monday, Nov. 6. Plan to attend a class meeting on Monday during resource to pick up your order for delivery. If you need to pick up earlier than resource, please see Mrs. Martin on Monday during snack break. Congratulations to Sylvia Peterson, Jessica Coulthard and Becca Baker for being awarded All Conference in volleyball. Vessa Pralle for being awarded Honorable Mention and Olivia Swanson for receiving the All Conference Sportsmanship Award. Opening night of the musical is tonight! Tickets are still available for sale in the MS/HS office. End of the Quarter: Just a reminder that the end of first quarter will be this Friday, November 3rd. There will be a financial aid & FAFSA workshop at UW-Richland Center on Thurs., Nov. 2nd from 5:30-7:00PM. See Mr. Donovan if you have questions. The financial aid meeting will be Nov. 8th from 5-7 at Western Technical College in Viroqua. Please see Mr. Donovan for a handout. Retake picture day is tomorrow. If you did not have your pictures taken, please stop in the office for a picture form. Those students who had their picture taken and want retakes, should bring their original picture packet with them on retake day. 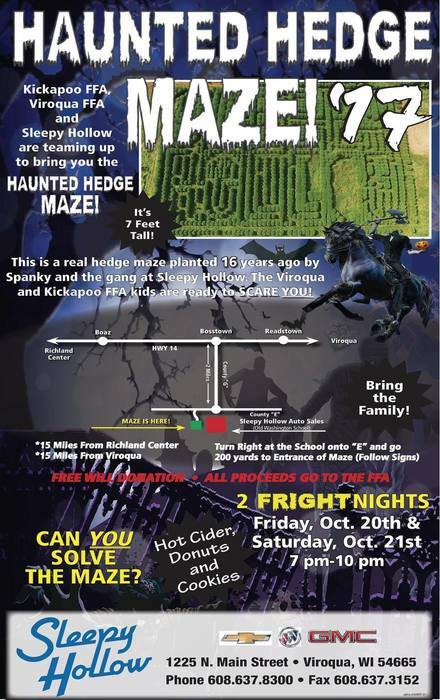 The Haunted Hedge Maze opens tonight at 7 p.m. and will be open tonight and tomorrow night from 7-10 p.m. Come on out for hauntingly good time! Music Department pizza sales money is due to Mr. Smith or Mrs. Miller by tomorrow, Friday, October 20th. Anyone interested in Wrestling this winter needs to sign up in the HS office with Marla by Friday. This is for both middle and high school students. There will be a HS Boys Basketball meeting in Mr. Petersen’s room from 3:00pm to 4:00pm on Monday, October 23rd. High School Football Equipment hand-in will be tonight at 4 pm. Please bring ALL of your WASHED equipment in as well as the money you still owe for parents night flowers. REMINDER: There will be a 1:00 p.m. early release today, October 18,2017. Kickapoo Panthers Volleyball team defeats North Crawford 3-0 in WIAA Regional Round 1. They advance to play @ River Ridge on Thursday, Oct 19 @ 7:00pm. VB Regionals: Come on out tonight and support our volleyball team as they are in Regional action against North Crawford! Game time at 7 p.m. Thanks to everyone who bought pizzas and came out Saturday to make pizzas for our big music fundraiser. 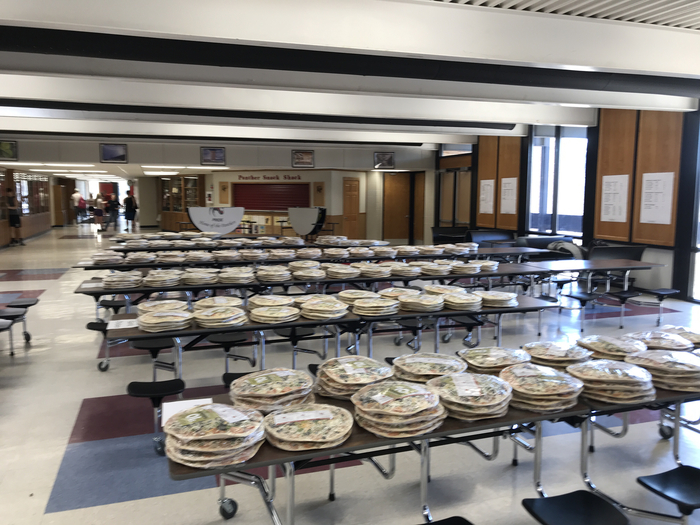 We sold 2050 pizzas and they were assembled in 4 hours! Money is due this Friday, Oct. 20th. JUDGES NEEDED: The Kickapoo Gifted & Talented Program is in need of judges for upcoming events. If interested, please contact Sarah Wallace at 627-0129 or swallace@kickapoo.k12.wi.us. RETAKES: Picture Retake day is set for Tuesday, October 24th. JOSTENS: Jostens will be here on Wednesday, October 11, to meet with the Freshmen regarding class rings and the Seniors regarding graduation. SWIMMING REMINDER: Just a reminder that elementary swimming starts this week and runs for the next 3 weeks. Please send a suit and towel for your child on their gym days. Congrats to the 2017 Lee Griffin VB Tournament Champions, the Kickapoo Panthers! Jostens Meetings: Jostens will be here Monday at 9:25 to meet with Freshmen wanting to order class rings and Seniors at 9:40 for graduation orders. ELEMENTARY SCHOOL SPIRIT NIGHT: If it is pouring rain tonight, the Elementary School Spirit Night at the Homecoming football game will be cancelled. WE'RE GOING TO THE DOMINICAN REPUBLIC: We are very excited to announce we currently have 34 travelers enrolled with 6 spots remaining for our Dominican Republic Trip 2019. Once we get to 40 we will then create a waiting list. Please remember to use promo code DOM400 and if you are choosing to add insurance to do so after you enroll. Please email Mr. Martinson at tmartinson@kickapoo.k12.wi.us with any questions. SCHOOL SPIRIT DAY: Friday's dress up day is School Spirit Day. Wear those Panther colors with pride! DOMINICAN REPUBLIC TRIP: Sunday is the last day to sign up for the Dominican Republic Trip. We have 34 travelers already signed up with only six more spots available. HOMECOMING DANCE: The Homecoming Dance will be held on Saturday, October 7th from 8-Midnight. The Grand March will held at 9 p.m. Admission cost is $5. It's National Walk to School Day! If interested in participating, please meet at the Viola Community Building by 7:30 a.m. this morning and we'll walk together to school. Kickapoo Volleyball beats Ithaca 3-0! TIME CHANGE: There has been a time change for Friday nights' School Spirit Night. Elementary students are to meet at 6:30 p.m. at the bleachers. Reminder that homecoming guest sheets are due Wednesday at 3:30 PM. JV FB tonight at Wauzeka is cancelled. It's Homecoming Week at Kickapoo! 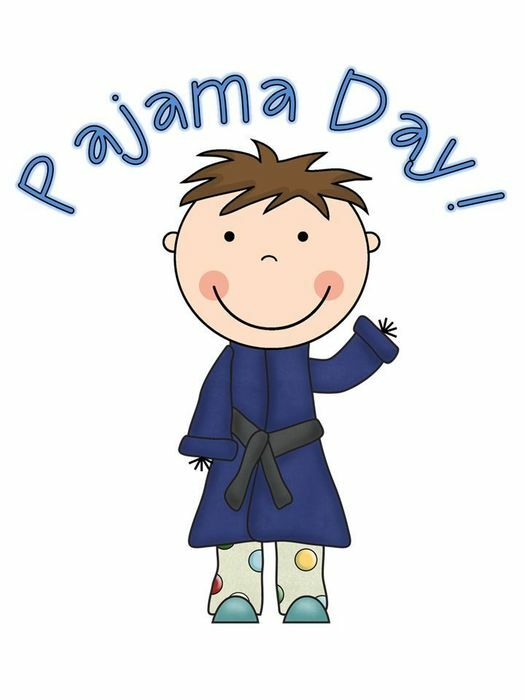 We kick off the week on Monday with Pajama Day! 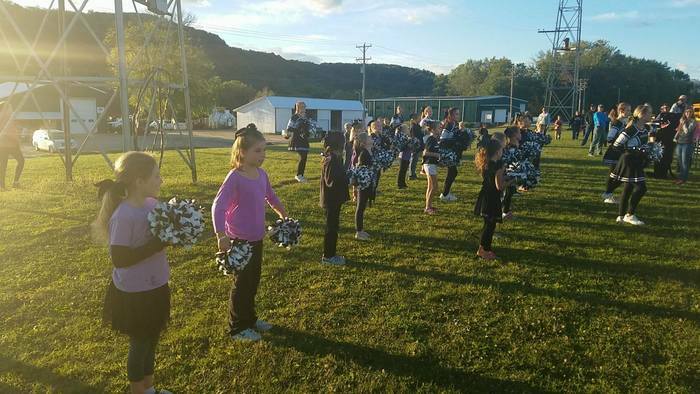 Kickapoo Cheer Camp participants are cheering tonight at the Predator game in La Farge! 2017 Homecoming Court: This year's Homecoming Court will be announced on Monday morning during the announcements. Tonight's Cross Country Results are available in the document section of the Kickapoo Website and App. HOMECOMING COURT VOTING: HS Fall athletes will be voting for Homecoming Court on Friday, September 28th during Resource Period. King/Queen voting will be on Wednesday, October 4th during lunch. Pizza Order Forms: Order forms are due TOMORROW, Wednesday, September 27th, to Mrs. Miller/Mr. Smith. No money is due at this time. Letter Jackets: A rep from Meca Sportswear will be here tomorrow, September 26, from 12 - 12:30 in the AP Room to take letter jacket orders. A $100 deposit is required. Football Parent's Night AND Senior Night will also be on Oct 6 with Homecoming. We will introduce parent's at 6:40pm. Parent's, please be on the field at 6:35pm. VB Parent's Night will be Oct 3. We will introduce parent's between the JV & V matches. VB Senior Night will be Oct 5. JV Football on Monday Sept 25 is cancelled. The JV Football game for Monday, September 25, has been cancelled. Yearbook Deal: Order forms for HS Yearbooks are available in the office. If ordered by tomorrow, Friday, September 22nd, and personalized, students will get up to 4 icons free. Yearbooks are $39. 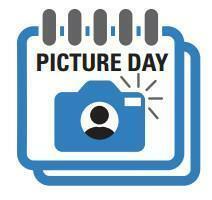 REMINDER: Picture Day is TOMORROW, September 19th. The Cross Country clothing orders are in. Please see Mrs. Geary to pick up your orders. She will be in her room before school this morning to hand them out. The yearly Music Pizza Fundraiser is underway! See a music student or Mrs. Miller/ Mr. Smith to order! Money from this fundraiser go toward band trips, choir trips, honors events, accompanists, etc... Orders are due Sept. 27th. Thank you for your support!